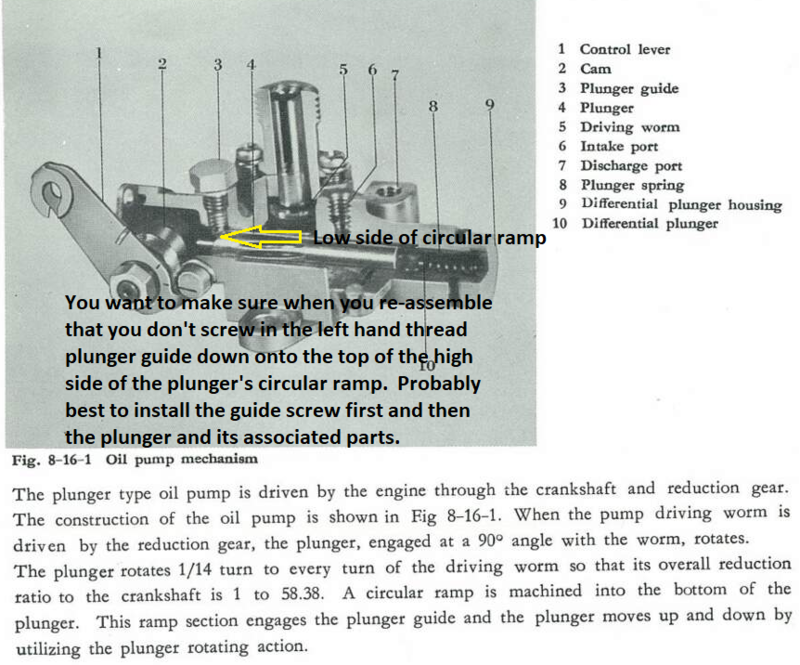 I think I read in this forum an old thread about how someone was having some type trouble with his oil pump after he had disassembled it and put it back together. Long story short, I think this is what he discovered he had done and lining it all back fixed the problem. I'm not trying to be vague, I'm just going by memory and I think I ran into this little hitch years ago also the first time I put a pump back together. Anyway, I just typed up this little warning just as a' heads up' for those not as familiar with the pump as others. You can also look down the plunger guide's screw hole and see if the low side of the ramp is up so that guide screw's 'roller' will ride nicely at the end of the plunger. You can of course spin the pump a bit as needed to align.